Sara Runs This Weigh: How Far Can I Run??? Today is Sunday and, therefore, long run day for me. I had some afternoon plans with some people from work to go out and eat at this fantastic Latin cuisine restaurant in Austin called Gloria’s. As a result, it wasn’t going to work for me to do my Sunday long run in the evening so I woke up early this morning and left the house by 8am and was at Town Lake trail by 8:30. I headed out on my run and it felt good. I stuck with how I refueled last week and was eating my first gel at mile 3.5-ish. At around mile 5 there are some baseball fields that I decided I would run around to keep myself from having to do so much of an overlap there and back at the end to end at 11 miles. Well, there is a whole ‘nother trail behind the ball fields, so I ran down that for a little bit and then turned around and came back to the main trail and continued on my way. As I was making my way along the last half of my run, I realized I was feeling good…really good. In fact, I started thinking maybe I would run more than 11 miles. I went back and forth with this thought as I ran along. Again, mile 8 was a fast one…it wasn’t the fastest this time, though. It was 2 seconds slower than mile 1. Anyway, I continued to run and I continued to feel really, really good. As I neared the end, I realized that I had run behind the ball field more than was necessary and hit the 11 mile mark very early. By that time, however I need to use the bathroom…and not for tinkle, if you know what I mean. There is a bathroom near where I park my car, but it’s across a pedestrian bridge on the other side of the river (about 2/10ths away from the car). At this point, I add up the mileage and realize I’m going to be at almost 12 miles when I get to the bathroom. Sooooo…I figured, what the heck, I’ll just go ahead and run extra mileage. And not just any arbitrary mileage. I decided on going 13.1 miles. Yea, you read that right. I PR’d big time today. I went 13.1 miles!!! 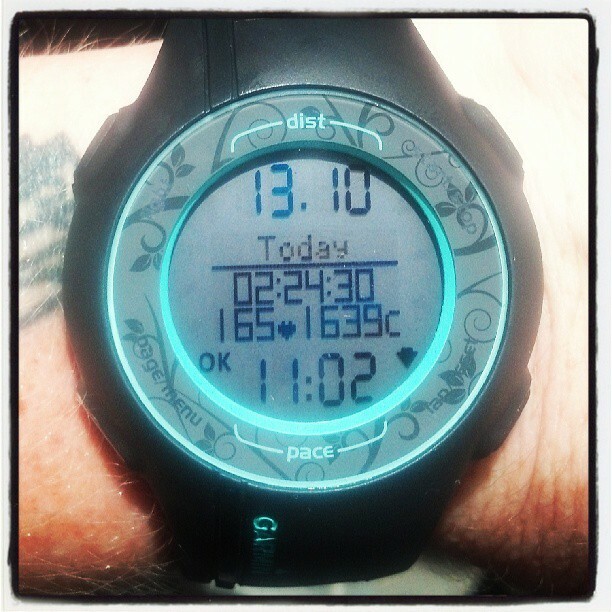 And I did it in 2:24:30…that’s an 11:02 min/mi pace!!! My mom asked me if I had to put out the flames on my shoes! Hahahaha! So, today was set up perfectly for me to do this. It has been OVER 100 degrees for the past week. Yesterday it was 108 degrees. Oh. My. God. That’s freaking hot! So, a “cold” (more like a “not-so-hot”) front blew in last night. It rained too. So, when I ran this morning, it was cool, mid 70’s to low 80’s, and there was nice cloud cover (I was actually wishing I had left my sunglasses in the car for 95% of the run…until the last ¾ of a mile when the sun made an appearance) and there was a very nice breeze. It was the perfect summer day for running…and PR’ing. Okay, last Sunday, I ran 11 miles in 2:04:17. I had to do some very difficult and confusing time math when I got home because I wasn’t looking at my Garmin when I hit the 11 mile mark today. 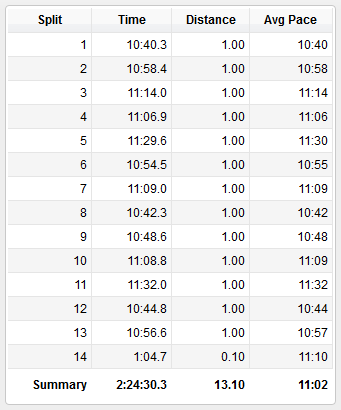 Anyway, I came up with today’s 11 mile time--2:01:48. That’s almost exactly 3.5 minutes faster!!! I’m so incredibly happy with today’s run. Oh and I would have run even further (because I literally felt like I could have run all day…that’s how good I felt), except I didn’t have any extra gels to refuel with me. So, I’m going to start doing my Sunday long runs early in the morning aaaaaaand I’m going to be taking 2 extra gels with me as well…just in case. The only thing that went awry with today’s run was that at mile 2.5 I realized what I had forgotten when getting ready this morning. My calf compression sleeves. Ugh. So, my calves are a little achy right now. I’m going to wear the sleeves to sleep in and hope I don’t have achy restless calves all day tomorrow. So, now I’ve have 2 awesome, rockin’ Sunday long runs in a row! I look forward to every single one of my runs, but I’m now SUPER excited for next Sunday’s long run. It’s scheduled as 11.5 miles, but who knows how far I’ll actually run!!! 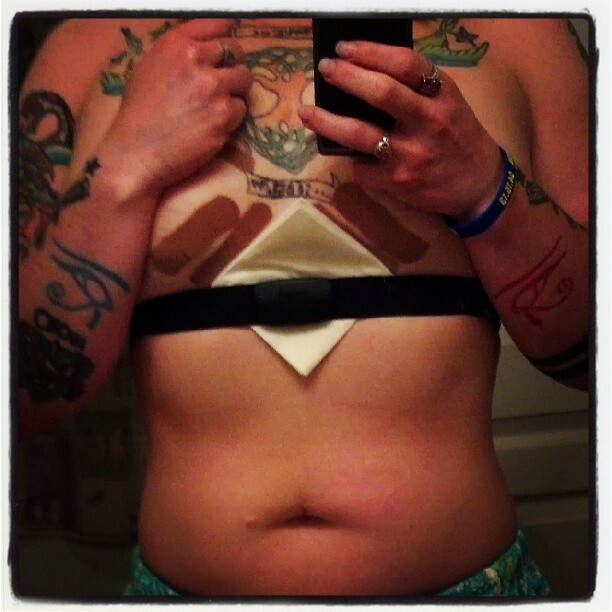 Oh, also, I decided the other day I should take a picture of what I do to stay chafe-free on my long runs. Band-aids and gauze pads do the trick for me. Hahahaha! Nice job! The "cold" front is making running here lovely too. i want this cooler weather to stay!! !